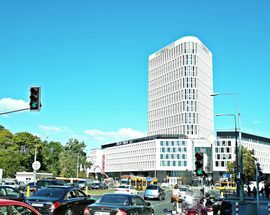 Plac Unii Lubelskiej finds itself situated in the area where one of Warsaw’s main thoroughfares, ul. Marszałkowska, blends into the never ending Ul. Puławska. Plonked between these two major arteries, the area never really established much of an identity and in general was pretty much just a place one passed through while trying to get from A to B. The name Plac Unii Lubelskiej means the square of The Union of Lublin and refers to the creation of the Polish-Lithuanian Commonwealth in 1569 which saw the dissolution of the Crown of the Kingdom of Poland and the Grand Duchy of Lithuania. The new commonwealth was ruled by one elected monarch who took on the roles of both King of Poland and Grand Duke of Lithuania and was governed by a separate senate and parliament. Although, seen as a democratic and peacefully instigated change, where trade thrived and shared laws were beneficial to both nations, one can argue that this was the point where the Polish nobility rose to the height of their powers, creating a class driven society which ultimately led to the partitions of Poland towards the end of the 18th century. Some Lithuanian historians take things a step further, claiming the commonwealth simply installed a ruling class of Polish noblemen within the formerly independent territory of Lithuania. 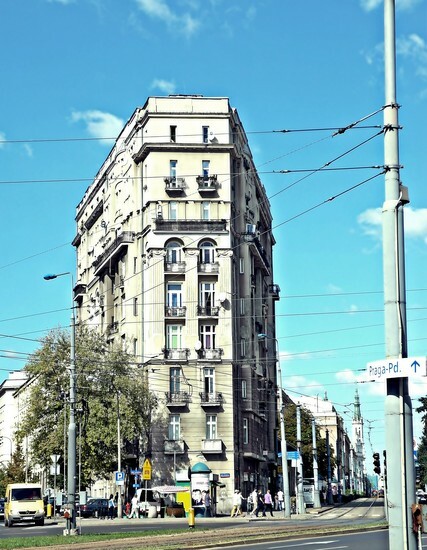 Over the past few years, Plac Unii Lubelskiej and its surrounding area has slowly started becoming quite a buzzing and popular place to hang out. The opening of the Plac Unii City Shopping mall in 2013 heralded in the beginnings of a new lease on life to this previously neglected zone. When I first moved to Warsaw, way back in 2000, one of the highlights of the week was a visit to the Supersam store at Ul. Puławska 2 (now the site of the luxury Plac Unii City shopping mall). When the store opened in 1962, it was Poland's first self service supermarket. 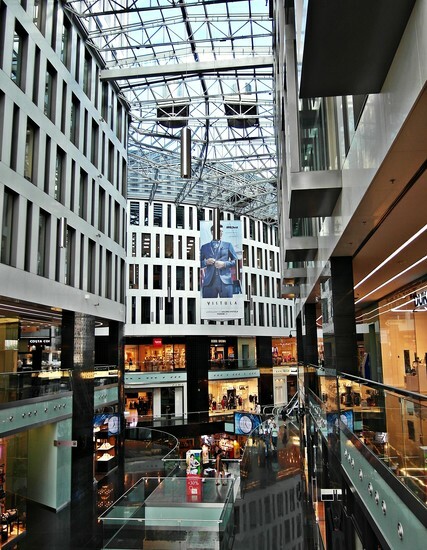 Its stunning modern design by architects Jerzy Hryniewiecki and Ewa & Maciej Krasinski, featured bow shaped suspended roofs and featured walls of glass and corrugated aluminum. 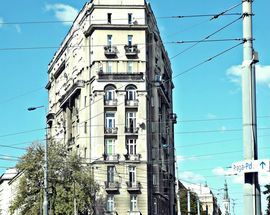 The building stood as a flagship of communist era construction, with its innovative design ideas and was a master class in architect/structural engineer collaboration. By the time I would frequent the store, in order to carry out the weekly shop, it was already a somewhat uncared for and melancholy shadow of what it had been in the past. The shopping experience itself was always a whole lot of fun, with grumpy old ladies in nylon housecoats forcing you to take a plastic basket before entering, then proceeding to follow you around the store, eyeing up your every move with more than suspicion; each customer a potential member of Fagan’s gang of miscreants, pickpockets and shoplifters. Of course, none of that could detract my attention from the fading glory of the building itself. When plans for the new mall were passed in 2009, this fabulous, retro space-age construction was demolished without anyone even batting an eyelid. Any other country would have slapped a listed building order on the structure but, as usual, Poland has an uncomfortable relationship with its past. In fairness, Supersam now operate a conventional looking and well stocked supermarket in the basement level of the new mall. Warsaw certainly seems to have had a long running love affair with the concept of huge, ultra modern shopping malls and it could be argued that with the massive success and popularity of the two main players; Złote Tarasy, in the very heart of town and Arkadia, in the Muranów district - as well as numerous other contenders dotted around the city and out into the surrounding suburbs - that the last thing Warsaw needed was yet another massive temple to consumerism. It was also abundantly clear that most of the malls, although designed and run to world class standards, did seem to suffer from the problem of rather repetitive tenants; the same stores, over and over again! In general, it was quite easy to forget which mall you were actually in, due to the fact that wherever you were, you were simply wandering past the same shops in a bit of a bleary eyed stupor and in a constant state of déjà vu. Luckily, Plac Unii appears to have approached the whole concept from a different angle. Granted, many of the recurring big guns are in evidence; Zara, H&M, Empik etc. 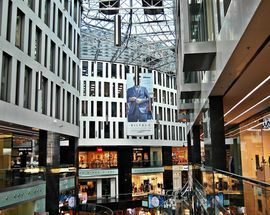 but you'll also find a whole host of interesting stores which have not blanket bombed every other mall across the map of Warsaw. Boutique shops stocking fashion and accessories by some of Poland's most sought after designers including; Tomaotomo by Tomasz Olejniczak, Potis & Verso womenswear and Ania Kruk Jewelry. We also love Mon Credo, a truly niche perfume and cosmetics emporium for those who think that Calvin Klein One is something you use to disinfect the toilet bowl with. Their product range includes rare olfactory delights from perfumiers like Serge Lutens, Acqua di Portofino and Juliette has a Gun. It's also worth mentioning that Plac Unii City Shopping run quite an extensive programme of events and fairs within the building, including the regular ‘Mokotowskie Spotkanie’ fair - which allows locally based designers, foodies and a whole host of other interesting little businesses to promote their products in the modern, commercial environment of the mall. Another nice event, which appears from time to time is the 'Jarmark Regionalny'; a food fair for producers of regional and natural products from around Poland. Everything about the shopping experience in Plac Unii City Shopping seems to run at a more relaxed pace than in the giant malls of Warsaw, this could well be why some of the more niche market and boutique stores find it the perfect place to set up their businesses, offering a less stressful and relaxing environment for the discerning clientele they are keen to attract. Even the basement level food court and cafes dotted around the centre are nice places to lounge around and just take a breather. You won’t find Burger King boxes, KFC bones, sticky Pepsi stained tables or mall-rats in Metallica T-shirts flicking fries at each other here! Well worth trying for a bite to eat or a drink is Piazza Ristorante, an Italian style bistro which could easily stand alone in any part of the city. From the outside, you can be forgiven for thinking that the whole shopping mall is going to be absolutely enormous; in fact the centre is cunningly split into three adjoining buildings, with a whopping 41300m2 taken up by office space and the retail area covering a more manageable 15500m2. 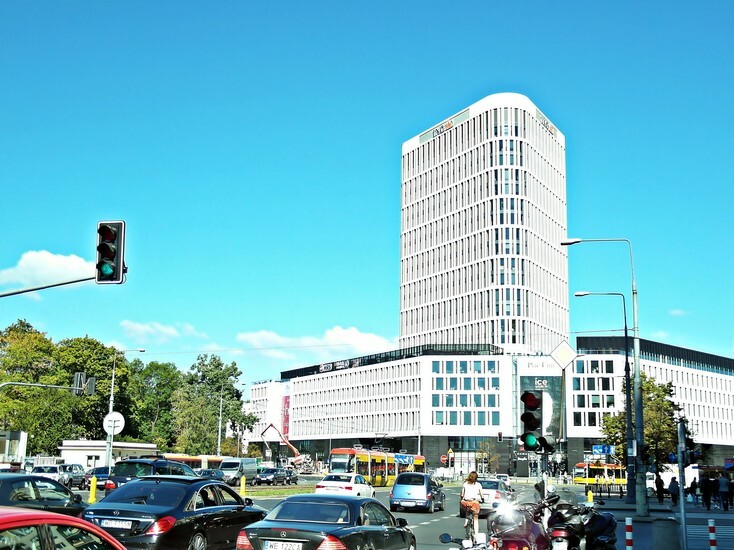 Designed by the renowned local architecture studio of APA Kuryłowicz & Associates, the exterior focus of the centre is the stunning 90m high tower which takes its inspiration from the iconic, Daniel Burnham designed, Flatiron building in New York (1902). Interestingly, one just has to take a quick peek across the Plac Unii Lubelskiej roundabout ,towards ul. 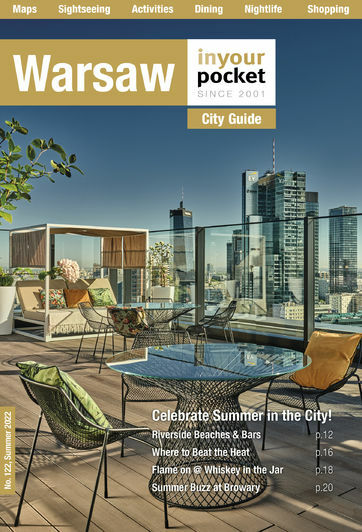 Polna, in order to view one of Warsaw's greatest architectural landmarks, the beautiful Kacperski townhouse, a building which is locally known as ‘Żelazko’ (the iron). Dating back to 1913 (strangely, architect unknown), it doesn’t take much imagination to see the architectural influence of Manhattan’s Flatiron building and a nice link between it and the ultra-modern tower of the neighbouring mall/office block. If you’re the sort of person who has the confidence, try asking the porter at the residential ‘Żelazko’, if you can have a look around. The interior with its run down original lifts, labyrinths of corridors and stunning lightwell is truly well worth a look. Considering the scale of this building, it’s also famous for the fact it has one of the smallest courtyards in the city! Other buildings of note on Plac Unii Lubelskiej include the Jan Łaski townhouse (1906) on the corner with ul. 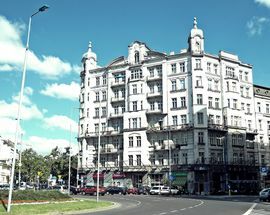 Bagatela – designed by Henryk Stifelman and Stanisław Weiss, the twin towered façade features some beautiful bas relief sculptures of vases and horns of plenty. From 1914-1944, this splendid example of early modernism served as one of the city’s major secondary schools. A similar example of early modernist architecture stands proudly on the opposite corner (ul. 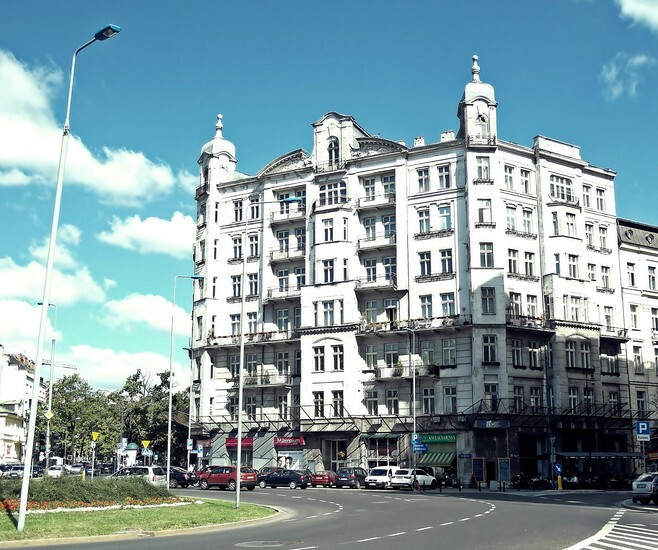 Bagatela 14), equally imposing and currently undergoing a major restoration, the Adam Bromke townhouse (1913) was home to one Poland’s first Empik clubs in the post World War II years. Originally formed as an international press and book club, Empik is now Poland’s best known and countrywide chain of stores for books, press and media products. Today, it’s home to the very hip, café/ bakery/bistro Być Może. The anoraks among us, myself included, may also get quite excited by the functional, modernist fire station, dating back to 1935, at ul. Polna 1. The building is still the headquarters for Warsaw’s fire department. If you are facing the city centre direction, any of the streets to your right will rapidly take you directly to the tranquility of the beautiful Łazienki Park. I say ‘supposed’ because if you are doing this on a weekend, chances are that there will be more people in the park than in the shopping centre plus all the surrounding cafes and eateries combined. If you decide to head straight back into the city centre via ul. Marszałkowska, at least try to walk the section to the neighbouring hipster Kingdom of Plac Zbawiciela. On this stretch of the street you’ll find some great little places to stop off and have a drink or some hearty nosh. We recommend stopping off at Chmielarnia (ul. Marszałkowska 10/16), a multitap real ale bar with a nifty sideline in Thai/Nepalese cuisine. Or, for a taste of old-school Warsaw milk bar decent dining, try the legendary Prasowy which is a couple of doors further down. It has a well established history, having first opened its doors in 1954 and continues being a popular and cheap dining experience for all sorts of people. Finally, movie buffs should consider checking out Kino Luna, a funky communist era cinema which shows popular and art house movies. Even if you don’t fancy a film, check out the cool retro façade. Happily, Luna was rescued from the wrecking ball and redevelopment a few years ago due to public outrage against the proposal.